The practice of misclassifying workers as independent contractors has been a persistent problem for years. A 2000 study commissioned by the U.S. Department of Labor (DOL) estimates that between 10% and 30% of audited employers misclassified workers. Between 2000 to 2007, the number of misclassified workers identified by state audits increased by 42 percent. In April 2018, the California State Supreme Court ruling in the Dynamex case established a new legal standard for determining whether or not a worker is misclassified, called the ABC test, that will make it more difficult for employers to misclassify workers. The California state legislature is currently considering legislation to codify the ABC test in state law. In this fact sheet we look at three industries in California where misclassification is known to be disproportionately high and could potentially be reduced by an ABC test – trucking, construction, and janitorial services. For each industry, we describe the demographics and wages of workers and misclassification practices by employers. According to a 2000 study by the US Department of Labor (USDOL), the trucking industry has one of the highest rates of misclassification nationally. Research suggests that misclassification is particularly egregious in port trucking. A 2010 report by the National Employment Law Project (NELP) found that 82% of port truckers are classified as independent workers, of which an estimated 80% are misclassified Port trucking companies frequently require that drivers purchase a truck and cover all truck-related expenses including fuel, taxes, insurance, maintenance, and repair costs, which significantly reduces the earnings of drivers. A meta-analysis of surveys conducted of port truckers between 2004 and 2009 found that the average work week for drivers was 59 hours and net earnings were $28,783 per year for independent contractors and $35,000 per year for employees. Independent contractors also were significantly less likely to have health insurance or retirement benefits. Port drivers have been fighting for years against these exploitative practices and since 2011 have filed more than 1,000 complaints with the California Division of Labor Standards Enforcement (DLSE) for wage theft violations related to misclassification. The Labor Commissioner’s Office has issued 448 decisions in these cases, finding that drivers were owed more than $50 million in wages collectively. The NELP report estimates that the port trucking industry is liable for close to a billion dollars in wage and hour violations each year. 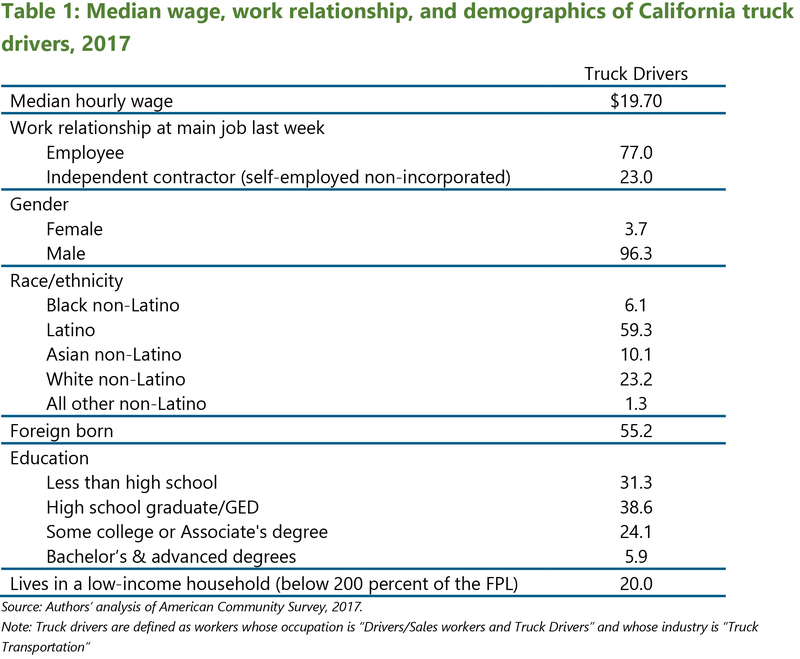 We estimate that nearly a quarter of truck drivers in California are working as independent contractors (see Table 1), although we do not have an estimate of how many of these independent contractors are misclassified. We estimate that the median wage across all truck drivers, both employees and independent contractors, is $19.70. However, some truckers who work as independent contractors report earning wages close to or even below the minimum wage, after accounting for expenses. We find that just over three quarters of truck drivers are people of color and more than half are immigrants. A significant number are in households with income below 200 percent of the Federal Poverty Line. Most have either a high school education or less. 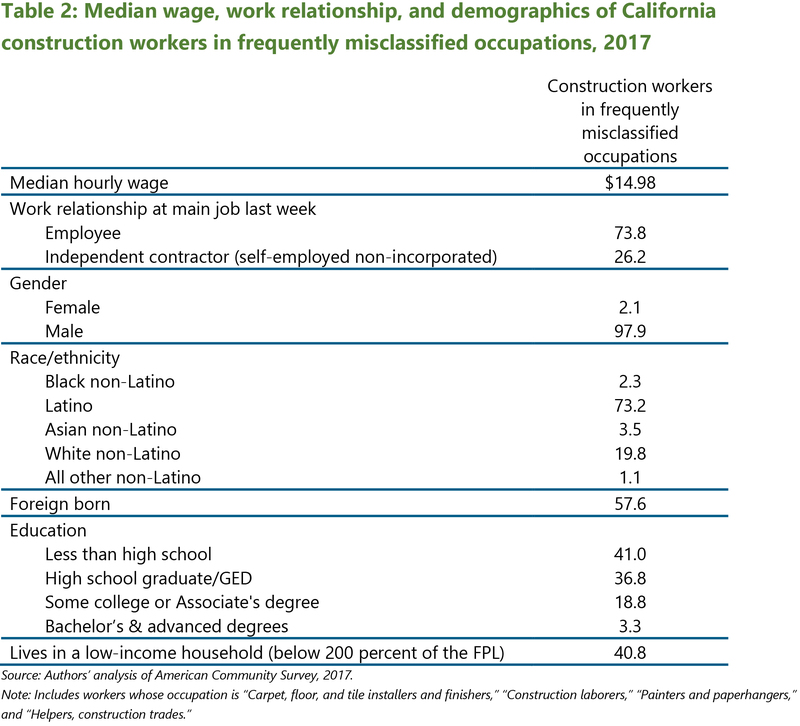 The Economic Roundtable report finds that misclassification is most common in the specialty trades and hands-on construction occupations, especially among workers whose occupation is carpet installer, laborer, painter, or construction helper. Table 2 shows our estimates of wages and demographics for all workers in these four construction occupations. A little over a quarter of these workers are independent contractors, while just under three quarters are traditional employees. An overwhelming majority are workers of color and well over half are immigrants. The median hourly wage of these workers is just under $15 an hour, with 40 percent living in low-wage households (defined as income below 200 percent of the Federal Poverty Line). Most have a high school education or less. Labor costs make up the majority of costs in the janitorial services industry and profit margins are thin, which has pushed firms to look for ways to reduce labor costs. Subcontracting is widespread, and some firms turning to illegal practices such as employee misclassification to remain competitive. It is common for janitors to be hired as independent contractors by a firm that is a sub-contractor to another contractor that has been hired to provide services for a building or company. Several large companies, such as Coverall, Jani-King, Jan-Pro, and CleanNet, have used a franchise model in which individual workers are considered franchises and classified as independent contractors. While we do not have a good estimate of exactly how many janitors are misclassified as independent contractors, the many cases that have been successfully fought through the legal system or complaints with state labor agencies suggest that it is common within the industry. For example, a worker advocacy organization in the Los Angeles area called the Maintenance Cooperation Trust Fund (MCTF) has helped to recover more than $26 million in unpaid wages due to misclassification and other labor law violations. In 2018, a federal circuit court found that Jani-King’s franchise model misclassified workers as independent contractors. However, the combination of misclassification and complex layers of sub-contracting in the industry often make it difficult for government agencies to enforce labor laws or for workers to recuperate unpaid wages through the legal system. The California Labor Commissioner’s Office now requires that janitorial service providers and contractors register annually with the department to make it easier for workers to identify the companies holding the contracts and hold them accountable for labor law violations, including misclassification. Table 3 shows our estimates of wages, work relationship type, and demographics for janitors. Misclassification is most common among janitorial services firms that contract out to other companies. Here, we identify janitors working for these types of companies by looking specifically at janitors working in the building services industry. 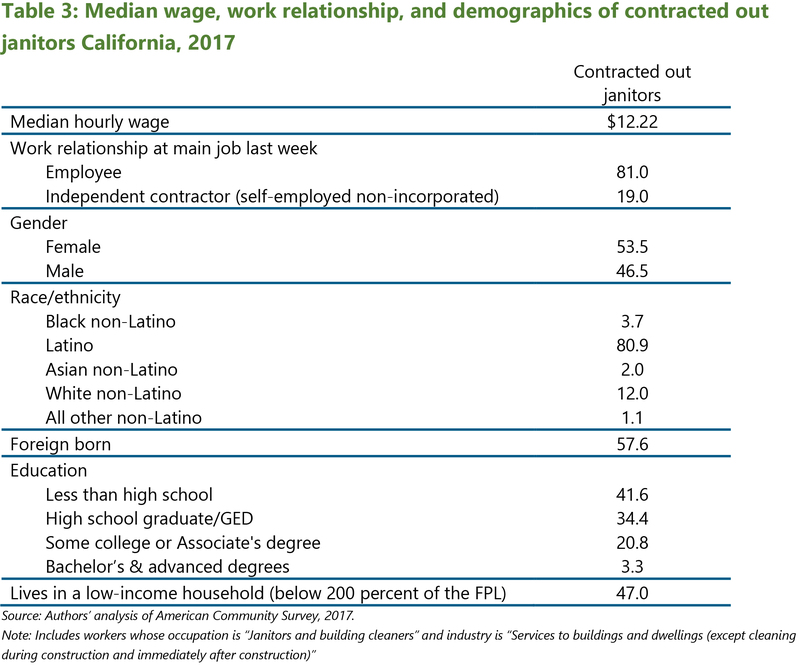 We estimate that approximately 19 percent of these janitors in California are classified as independent contractors, although we do not have an estimate of how many are misclassified. The median wage for janitors is $12.22 an hour, which means that well over half would be considered low-wage workers. Janitors are disproportionately Latino (80.9 percent) and foreign born (57.6 percent). Nearly half live in low-income households (defined as income less than 200 percent of the Federal Poverty Line). Planmatics, Inc., “Independent Contractors: Prevalence and Implications for Unemployment Insurance Programs” (US Department of Labor, Employment and Training Administration, February 2000), https://wdr.doleta.gov/owsdrr/00-5/00-5.pdf. U. S. Government Accountability Office, “Employee Misclassification: Improved Coordination, Outreach, and Targeting Could Better Ensure Detection and Prevention,” September 9, 2009, https://www.gao.gov/products/GAO-09-717. Catherine Ruckelshaus and Ceilidh Gao, “Independent Contractor Misclassification Imposes Huge Costs on Workers and Federal and State Treasuries,” National Employment Law Project (blog), December 19, 2017, https://www.nelp.org/publication/independent-contractor-misclassification-imposes-huge-costs-on-workers-and-federal-and-state-treasuries-update-2017/. Sara Hinkley, Annette Bernhardt, and Sarah Thomason, “Race to the Bottom: How Low‐Road Subcontracting Affects Working Conditions in California’s Property Services Industry” (Center for Labor Research and Education, University of California, Berkeley, March 8, 2016), http://irle.berkeley.edu/race-to-the-bottom-how-low-road-subcontracting-affects-working-conditions-in-californias-property-services-industry/. Rebecca Smith, David Bensman, and Paul Alexander Marvy, “The Big Rig: Poverty, Pollution, and the Misclassification of Truck Drivers at America’s Ports” (National Employment Law Project and Change to Win, December 8, 2010), http://teamster.org/sites/teamster.org/files/povertypollutionandmisclassification.pdf. Rebecca Smith, Paul Alexander Marvy, and Jon Zerolnick, “The Big Rig Overhaul: Restoring Middle-Class Jobs at America’s Ports Through Labor Law Enforcement” (National Employment Law Project, Change to Win Strategic Organizing Center, and Los Angeles Alliance for a New Economy, February 2014), https://nelp.org/wp-content/uploads/2015/03/Big-Rig-Overhaul-Misclassification-Port-Truck-Drivers-Labor-Law-Enforcement.pdf. State of California Department of Industrial Relations, “Labor Commissioner Posts List of Port Trucking Comapnies with Unsatisfied Judgments for Labor Violations,” January 2, 2019, https://www.dir.ca.gov/DIRNews/2019/2019-01.pdf. Steve Viscelli, The Big Rig: Trucking and the Decline of the American Dream, First edition (Oakland, California: University of California Press, 2016). Yvonne Yen Liu and Daniel Flaming, “Sinking Underground: The Growing Informal Economy in California Construction” (The Economic Roundtable, September 2014), https://economicrt.org/publication/sinking-underground/. Wendy N Davis, “Do Janitorial Firms Cash in by Misclassifying Workers as Independent Contractors?,” ABA Journal, September 2014, http://www.abajournal.com/magazine/article/do_janitorial_firms_cash_in_by_misclassifying_workers_as_independent/. Maintenance Cooperation Trust Fund, accessed February 25, 2019, https://www.janitorialwatch.org/about. “US Employment Litigation Round-Up for October 2018,” Mayer Brown, November 12, 2018, http://www.mayerbrown.com/us-employment-litigation-round-up-for-october-2018-11-12-2018/. Labor Commissioner’s Office, California Department of Industrial Relations, “Labor Commissioner Launches Online Registration for Janitorial Service Providers,” Cision PR Newswire, June 27, 2018, https://www.prnewswire.com/news-releases/labor-commissioner-launches-online-registration-for-janitorial-service-providers-300673508.html. The low-wage threshold for California for 2017 (defined as two thirds of the median wage) was $14.36 an hour. See Ian Perry, “Low-Wage Work in California Data Explorer” (Center for Labor Research and Education, 2018), http://laborcenter.berkeley.edu/low-wage-work-in-california/.